It is everybody's wish to live healthily for lifetime. Do you have any idea how? Probably, we can find out and do something that is close to the answer. Do You Know How Crucial Eating and Chewing Is to Your Health? It is important to chew hundreds of times with your teeth to help provide stimulation to your brain. It also helps in the secretion of saliva for digestion purposes. We have a lot of reports that people who were not able to walk previously (some were almost bedridden), had eventually recovered and regained their ability to walk well just because of eating and chewing properly. It is believed to be related to a wide range of brain activation caused by eating or chewing the foods with the teeth. Other reports say that their speaking capabilities had improved, too. These wonderful happenings occur simply because chewing with your teeth gives perfect stimulation to your brain. The brain will then be able to stimulate your entire body with proper brain signals. Of course, the food's taste and smell matters, too, and most importantly, its texture. Each texture gives sound. For example, the tasty sound of juicy apple every time you chew, and the sound of big sweet strawberry around your mouth. Each sound produced when you chew gives healthy sound to your brain through your teeth. The roots in the teeth is called "periodontal ligament", which works as cushion between the teeth and gum or tooth ridge. It also acts as an excellent sensor that can precisely detect the force applied to the teeth. Yes, there are various sensory nerves within the mouth and one of the most important sensory channels when chewing food is the periodontal ligament. And yes, the brain has significant relationship with the teeth. 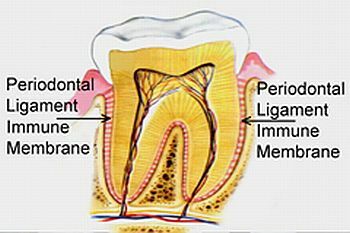 Sensory nerves in the periodontal ligament are connected to the nervous system. Chewing stimulates the periodontal ligament and is perceived by the brain. It promotes brain activity as chewing exercises the brain. Chewing can help increase the activity of cells in your brain and prevent them from aging. Therefore, your thinking and learning ability as well as your memory increases. For children, eating and chewing can promote their brain development and will help improve their work efficiency. For the elderly, chewing can help slow down the process of brain aging. What effect would it have if dentures are removed? We conducted experiments among several people who wear dentures, and we concluded that the majority of them say that they easily lose their balance when their dentures are removed. Aside from balancing, they concluded that even their body strength reduced dramatically. Some even say that they easily lose memory and active energy. The average human produces a quart of saliva a day—about 10,000 gallons in a lifetime. Most tooth loss in people under 35 years of age is caused by athletic trauma, fights or accidents. Most tooth loss in people over age 35 is from Periodontal Disease. Let us enjoy eating and chewing foods, and get healthy and strong!